April 2013. A phenomenon struck the internet. Twitter feeds quickly became over run with mention of the ‘Candy Box’. To outsiders, it seemed like boxes of chocolates had suddenly been posted through the doors of millions. To bosses, it appeared that a plague of inefficiency had struck businesses the word over as productivity rates dive bombed. Candy Box had been unleashed on the world, and everyone was playing it. A web-based game made up of little more than images made from stuck-together-letters and a ticking counter of collected candies, people logged on to ‘see what it was all about’ and were still there two hours later, with 7,200 candies in their inventory. If you were, or even are, one of those players, then you’re part of a community of 1,430,350 players. Well, within that ballpark. 1,430,350 is the number of unique saves logged to date for Candy Box. It’s a figure the long-haired, 19-year old French computer science student aniwey (never spell his name with a capital ‘a’) never expected to see at all. “This is not accurately the number of players – because some players can use multiple saves, multiple accounts. But it gives you a good idea, I think. So that was just incredible for me just to have so many players playing the game. I really, really did not expect that. I just spent all my time responding to emails after the release,” he said at GameCity festival in Nottingham. Candy Box can be easily classified as a success, then. What do you do with successful IP? You make a sequel. And today is the day when that sequel hits the web. Candy Box 2 is available to play right now, and predictably brings the same addictive gameplay to the browser window, but with a few improvements. A drop-down menu offers French and English language translations, but aniwey has hopes that fan translations will come pouring in now the game is available for everyone to play. Translations are not the only thing on aniwey’s mind, though. 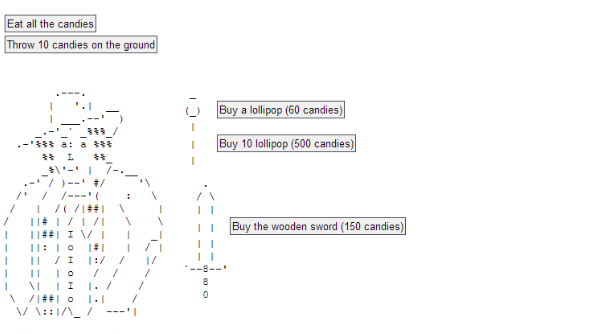 Candy Box was the work of aniwey alone, but the ASCII art used to create the game’s distinct style was all pulled from the internet. Look at the game’s credits and the art is all attributed to artists aniwey has never even met. As such, he couldn’t allow the community permission to download the game’s code and mod it. “I couldn’t make Candy Box in a way that you could add content and features after the release. And that’s bad, because I think it’s great for the community. People get more hooked to the game, and I couldn’t do that,” he explained. For Candy Box 2 things are different. The detailed environments are created by artists recruited by aniwey himself, and as a result the entire game’s code is available under a Creative Commons license. “Anyone has a right to take the game’s code, to modify it, to share it with anyone else – even for commercial purposes. So you can take my code, modify the game and make another game without even asking for permission,” said aniwey. The only restriction placed on the Creative Commons license is that modifiers allow their work based on aniwey’s code to be modified too, passing on the same spirit to their players. It’s like sharing a big box of chocolates, rather apt for a game with such a sweet tooth.